Our favorite time of the year is finally here – #CreepyCulture is back! You created some exceptionally eerie agar art in the past, and we can’t wait to see what you conjure up this year! 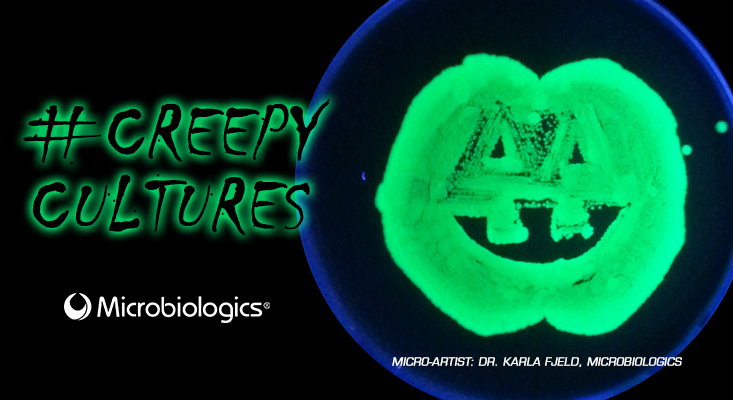 Unleash your creative side and send us your creepiest, crawliest Halloween-themed agar art by Friday, October 19, 2018, for a chance to win awesome prizes including Microbiologics swag bags and Visa gift cards. Create Halloween-themed agar art using your favorite microorganisms and agar. Share an image of your art with us by Friday, October 19, 2018. Winning plates will be chosen by Microbiologics employees. For extra creepy cultures, use our UV-BioTAG™ strains (GFP tagged microorganisms) to make your design glow like the plate shown above, designed by our Research and Development Scientist, Dr. Karla Fjeld. We will announce the winners and share all submissions Thursday, October 25, 2018, on the Microbiologics Blog and our Facebook, LinkedIn and Twitter pages. *	Would you like to receive updates from Microbiologics? Even ghosts are afraid of AMR pathogens! E. coli on LB agar.